We make lots of handmade crochet items. Ranging from amigurumi, keyrings, blankets, pillows etc…….. whatever creative idea strikes! We will be adding more of our items as and when we make them. Check out our Blog for our latest creations. It’s early days but we will be adding more items as soon as possible. Check us out and give us a ‘like’ or ‘favourite’ us and show your support. 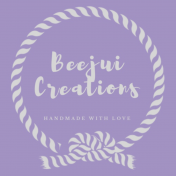 Beejui Creations, Powered by WordPress.com.